Desktop speakers have become a popular trend in audio, especially for college students where space and funds are limited. Because these types of speakers are often played at lower volumes than typical home loudspeakers, efficiency and bass extension are less critical. This allows for a simple full range driver to be used instead of a multi-driver array with complicated crossover networks. Therefore the main factor that will affect the sound of the speaker is driver choice and cabinet design. 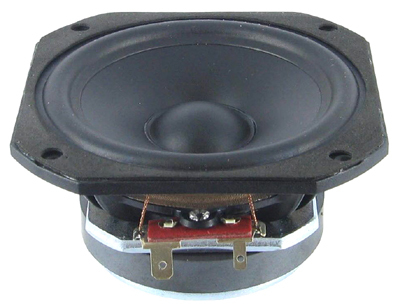 Since the driver choice has been narrowed down to three options, this project will focus on how to shape the sound of the speaker through internal cabinet design. This project is designed to introduce the basics of cabinet design to beginner speaker builders. For the purposes of electronic simplicity and cost, a single full range driver will be used per cabinet. Three popular drivers have been selected for their differing design, look, and capabilities. Descriptions and links to driver data are listed below. Members will pick one of these drivers and design a cabinet to their acoustic and aesthetic preference, using Thiele-Small parameters to simulate the frequency response. Once the design has been finalized, the members will use the Cal Poly shops to cut and assemble their speaker cabinets out of Medium Density Fiberboard. As an end result the member will have a one-of-a-kind self-designed and manufactured speaker. The Peerless (formerly Vifa) TC9 is one of the most popular divers on the market, and for good reason. It has exceptional power handling, frequency extension, and a classic treated paper cone. It has a rigid cast polymer basket and is easily rear or face mounted. The Fountek FE85 is another popular driver, but unlike the TC9 it sports an aluminum cone. This not only looks cool, but is lighter and more rigid than paper. That combined with the oversized motor translates to fantastic transient response. However this driver has the least amount of bass extension of the three, so a separate subwoofer may be required if you prefer more bass. The Aurasound is the most expensive of the three driver, but it also has some interesting capabilities that the other two drivers do not have. While less efficient than the other two, it has considerably more bass extension. It also has the highest power handling of the three, which is good because it will require more power. If you prefer a bassier listening experience and have the extra power and cash, this is the driver for you. This project is currently in progress. If you are participating in the project but are not on the email list, talk to Brian Hillenbrand at a general or project meeting.